I'm in the final stages of finishing up my office and I have three blank cork boards staring back at me waiting to be finished. You know I love me some orange. So do I stick with a neutral background to let all of my inspiration shots shine or do I go for a dose of color! Help a lady out. What would you do? go for bold, i will def match your beautiful room! With THREE blank cork boards, I'd pull the three top colors you love and use one on each board. I wouldn't necessarily go solid color, but maybe something that has a texture/subtle pattern -- maybe a herringbone or linen or something... Then you could use a neutral ribbon or frame. Go bright! And where did you get the fabric on the ottoman? It's fantastic! and um, i want the wall paper in the kate spade ad. le sigh. Color! I love orange, but I am kind of feeling yellow with that fabric you have. Either one would be fab though! What if you did a neutral color, but added an orange bias tape border? Your office is fabulous - loved the sneak peak. I have to vote for color...can't wait to see what you choose! Color, go bright and bold! I just purchased that exact fabric for 2 little chairs in my master, so happy to see it on another piece, thanks for the visual! I have two in my office that I plan to paint in a light, muted gold metallic paint. That way I get something more interesting but still fairly neutral! Go for orange...it is an inspiration board, right? Loving the peak of your space! My natural instinct is to say that it is a little overwhelming to have a bright color AND lots of papers on a corkboard...However, with three of them, maybe do one a bright orange and the other two more subtle, but coordinating fabrics! Bold! Go bold I say! It isn't like the boards are true furniture pieces, so when you get tired of them swap out the fabric. I agree with Annie, because I think the individual color boards will help you focus on your dreams! I vote for a bright and bold burlap or grass cloth. Go with orange! It's such a hot color right now and easy to change if you get tired of it. 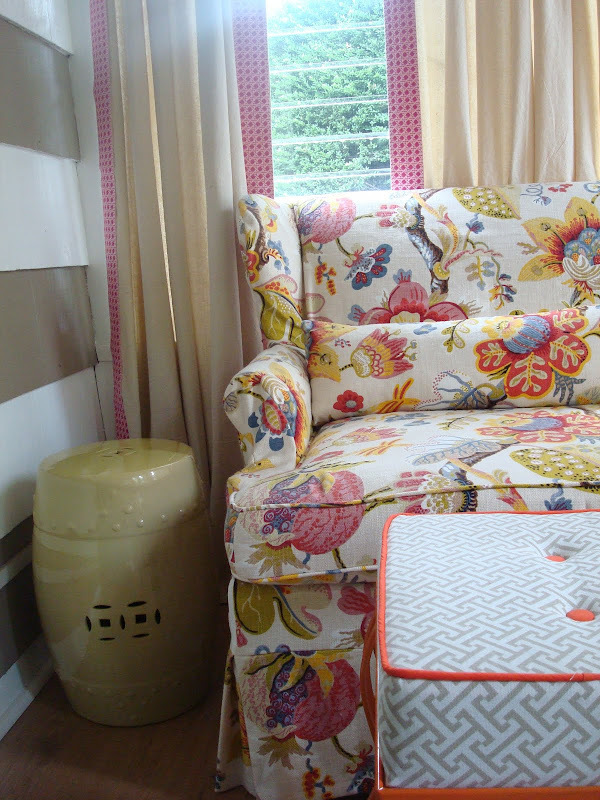 First of al -love,love,LOVE the fabric on the armchair! I was also floored by the first photo from Kate Spade, my sister has the exact same chest of drawers! Seriously love that ottoman! If I were you I would go with a neutral color for the boards-white or off white. Then I would frame the boards and paint the frames orange, green or yellow (all 3 the same).That way you get the best of both worlds-a neutral surface to allow your inspiration shots to shine and that shot of color that speaks to your personality. I love reading your blog and I am sure whatever you decide will look great! i love it all! go for the bold! Camila - I like Kendra's idea. Maybe something inspired by that gorgeous ottoman in your picture? A neutral pattern and then trimmed in some amazing bold colors? Can't wait to see what you do - I'm sure it will be fantastic! love that picture you posted by kate spade. 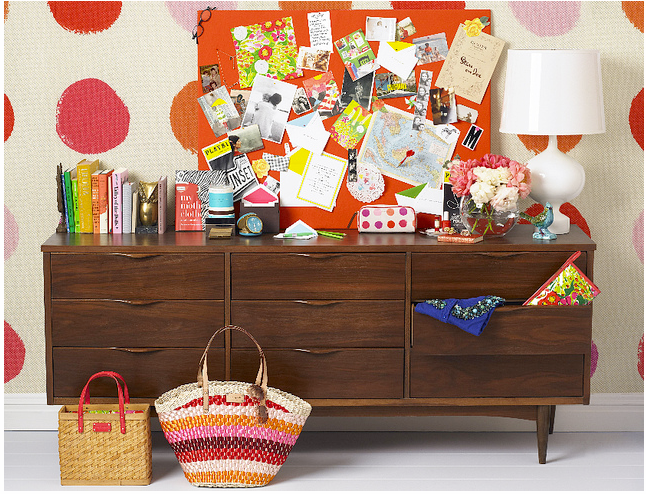 definitely need a colored cork board... my vote is orange! !